The first principle, “like cures like,” means that a substance, which—in a large dose—would cause a certain symptom in a healthy individual, will, in homeopathic potency, cure the same symptom in a sick individual. For instance, Syrup of Ipecac is often given to induce vomiting in cases where a child or animal may have eaten a toxic substance. Giving the syrup will cause intense nausea, profuse salivation, and vomiting. Therefore, you would give a dose of homeopathically prepared Ipecac to an animal that was exhibiting these same symptoms, in order to cure them. The “minimum dose” means that the practitioner will give a highly diluted and specially prepared form of the substance, that is, a potentized remedy, rather than a large amount of substance. A dog with motion sickness, for example, would get an infinitesimal dose of Ipecac, which has been prepared so that we are actually using the energy of the substance, rather than the actual physical substance with its (rather unpleasant) physical properties. (It worked like a charm for my sensitive dog!) 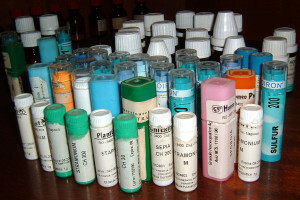 Homeopathic remedies are made from natural substances such as plants and minerals. The serial dilutions that a remedy goes through eliminate any toxic effects of the natural substance. Many remedies are made from a variety of snake venoms, poisonous plants, and toxic substances like sulfuric acid. That is the beauty of homeopathy—to capture the essential nature of substances and turn them into instruments of healing. Holistic practitioners consider that there are two main forms of disease: acute and chronic. Acute disease would be something like a wound or injury, or a sudden (and usually self-limiting) illness like a cold or flu. A chronic disease would be a condition such as diabetes, asthma, seizures, recurrent infections, or arthritis. Such conditions often have a gradual progression and are not typically “curable” by conventional medicine, although the symptoms are often suppressed with drugs. Veterinary homeopaths today consider virtually every domestic animal to have some form of chronic disease, due to many generations of over-vaccination and under-nutrition. Serious chronic disease is not something that an ordinary person can treat homeopathically. If your cat has a chronic illness and you wish to use this modality, it is best to establish a relationship with a certified veterinary homeopath, who will carefully monitor the case and instruct you on when and how to give remedies. However, there are still many minor problems that crop up that can be treated at home, such as injuries, or acute flare-ups of chronic problems that just need symptomatic management until your veterinarian can be contacted. Generally, you will use low potencies (up to 30C), and give one dose every 6-8 hours for up to three treatments (unless specifically stated otherwise). If you are not seeing results after the third dose, that remedy is probably not going to work, and you should seek veterinary care, either holistic or conventional. Giving the remedy itself is easy. While many practitioners caution about handling the remedies, they are really not that fragile. (However, they should be stored out of direct sunlight and away from strong odors–such as spices or perfumes–and electromagnetic fields, such as a microwave or refrigerator motor). You can give them directly by mouth, mix with a little food, or mix with a little water, then give a dropperful of the water (which has been imbued with the energy of the substance). The following is a list of my “Top Ten” favorite remedies for treating various feline woes. These are specifically chosen for cats, and while they may be given to other species, other remedies may be more applicable. This remedy is one of the most important in the homeopathic arsenal, especially for cats. Aconite, made from the lovely but highly poisonous plant “Monkshood,” is the first remedy for sudden fear or terror. A dose of Aconite should be given to any cat that has nearly met its Maker—chased or mauled by a dog, a narrow escape from the wheels of a car, or any situation where a cat would be “frightened to death.” This intense, deep fear, when left untreated, can result in a cat with seemingly minor injuries taking a drastic turn for the worse or even dying. The other major use for Aconite is for any “-itis” or sudden inflammatory condition. It is great for “aborting” upper respiratory infections (rhinitis or sinusitis) if given at the first sign of fever or sneezing, and may have a similar effect if given early for flare-ups of chronic cystitis (Feline Lower Urinary Tract Disease, or FLUTD episodes). A complete inability to urinate, however, especially in a male cat, requires immediate veterinary intervention. Occasionally, Aconite will cure chronic conditions that originally began after a deeply frightening experience. Very high potencies are usually necessary. This remedy is made from the honeybee, and is used for ailments that are similar to a bee-sting, with a lot of burning, redness and swelling. Usually we think of this remedy for swelling that is unusually intense, and is relieved by application of cold compresses. It can be used for insect bites or stings of any kind that have a red and swollen appearance. It is a good remedy for cats with chronic herpesvirus conjunctivitis (eyelid swelling) that is very red and puffy. Apis patients may be particularly irritable. It is sometimes useful for tonsillitis, which may sound unusual in cats, but is common and probably under-diagnosed by conventional veterinarians. No home should be without Arnica, a remedy made from a floral member of the Aster family. It is the primary trauma remedy: essential for bruises, blows, falls, and concussions. It is a good remedy to give any cat post-surgically (especially after tooth extractions), to help heal the tissues. It is essential first aid for any cat hit by a car or crushed by a door—of course, do seek emergency medical care immediately! I once used it successfully on a kitten who was accidentally stepped on by a houseguest, with resulting severe trauma to the chest and lungs. In humans we think of it as a sort of “Monday morning” remedy, to ease achy muscles that were overexerted on the weekend. Arnica pain has a sore, bruised feeling. Arnica is also excellent for healing chronic conditions resulting from old injuries, such as post-traumatic arthritis. This wonderful remedy, made from the toxic metal arsenic, has great application in many feline conditions. It is the primary remedy for poisoning of any kind, but especially for food poisoning, or for having eaten something a little “off.” Vomiting and diarrhea together often call for Arsenicum. Watery stool, especially with blood, is another indication for this remedy, as are acrid (burning) discharges from the eyes or nose—the kind that take the fur off when you wipe them away. Cats that eat well but vomit within a few minutes often respond to Arsenicum. Cats in an Arsenicum state are usually very chilly, restless, anxious or fearful, and thirsty for frequent, small drinks of water. Of course, this describes many cats in their “normal” state and indeed, Arsenicum is a common feline constitutional remedy. It is also a major “vaccinosis” remedy (one that can relieve symptoms that are commonly attributed to vaccination, such as asthma or irritable bowel syndrome). For very ill cats who are nearing death, Arsenicum often provides at least temporary relief of discomfort, and may ease their transition as well. Arsenicum in very high potency is sometimes used for euthanasia. This is not a frequently needed remedy, but it does have two very specific applications. One is for breathing difficulty, where the cat seems unable to get enough air (due to asthma, heart or lung disease, or any other condition). The other use is for shock. Severely injured cats will rapidly become shocky—their bodies, especially the extremities, feel cold and their mucous membranes may be pale and bluish rather than pink. Cats needing this remedy obviously also need emergency medical care, but while you are on the way to the vet, give this remedy every 10-15 minutes, to help forestall cardio-respiratory shutdown. Carbo-veg is also helpful in cases of known carbon monoxide poisoning. This is the number one cat-bite remedy. If you know your cat has been in a fight, especially if you find any evidence of a bite wound (but even if you don’t), give a dose of Ledum as soon as possible. Ledum will often prevent abscesses from forming if given quickly after a puncture wound. I have used it very successfully myself after being bitten. Ledum wounds tend to feel better with application of cold rather than heat. Any insect bite, injection, or other deep puncture may also call for Ledum, and it is absolutely essential to give immediately after having your cat microchipped. The origin of this remedy is the primitive plant, club moss. As you might expect from the name, this is a good remedy for vomiting problems. Known in humans as an excellent hangover remedy, it has great application in cats for chronic vomiting and suspected ingestion of foreign objects. (Nux-v has helped my patients expel such delicacies as baby socks and chicken bones as well as some world-class hairballs!) Nux-v can be used for spasms or cramping, as well as for constipation. It soothes irritated tummies as well as simply irritable cats. (Nux-v patients tend to be very grumpy and want to be left alone.) Nux-v comes from the same plant as the well-known poison, strychnine. Here’s an interesting remedy from a plant most of us would rather avoid—poison ivy. Rhus-tox is a wonderful remedy for arthritis, especially where the cat is very stiff upon rising but feels better after moving around for a few minutes. Rhus-tox is a chilly remedy—these patients seek warm places to sleep or cuddle up. The other major indication for Rhus-tox is an ailment that comes on after a change in weather, especially when it turns cold and damp. Those pesky upper respiratory infections that seem to occur in the variable weather of spring and fall may respond very well to this remedy. If you didn’t have Ledum on hand, or your cat was in a fight that you didn’t know about, then you may be reaching for this remedy. Silicea, made from silicon dioxide (common sand), is terrific for healing abscesses. In low potency (30C or less), it will tend to draw the abscess out and cause it to drain, getting rid of the built-up waste products of infection. Silicea is also said to help externalize foreign bodies—you might want to try it for your next splinter! Silicea patients tend to be meek, timid, sensitive, and chilly. These patients can often be characterized as “lacking grit.” It is another major feline constitutional remedy and is also used for vaccinosis. This remedy has successfully cured litterbox avoidance problems in a few cats—if you try it for this purpose, give a single dose of 30C potency one time only. Pronounced “thoo’-yuh,” this is the primary vaccinosis remedy for all species. If you must have your cat vaccinated, it is a good idea to give a dose of Thuja 30C within two hours of the injection. It is also helpful in case of immediate vaccine reactions such as vomiting or diarrhea occurring within a few hours of the shot. Thuja, which is derived from the northern white cedar, Arbor vitae (“Tree of Life”), is indeed a lifesaver. Thuja symptoms tend toward the skin, with rashes, eruptions, warts, cysts, and tumors being common indicators for this remedy. Its other major spheres of action are the gastrointestinal tract (it is excellent for “sputtery” diarrhea) and the urinary tract (some cases of chronic cystitis are helped by this remedy). Most of these remedies are available at your local health food store in potencies up to 30C, or you can obtain them from a homeopathic pharmacy. While these ten remedies will not replace competent emergency medical care or the long-term support of a certified homeopathic veterinarian, they may get you through a crisis or two, and using these remedies appropriately will give you confidence and demonstrate the gentle power of this modality. Why Did My Cat Pee Outside the Litterbox?